Happy Saturday! 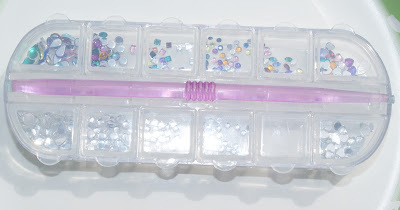 Another It's So Easy Saturday is upon us and I shifted a little bit away from the fabulous Stripe Rite paints and moved onto one of my passions in life: RHINESTONES! The rhinestones come in six different shapes, in multicolor and clear. I like this packaging better than the rhinestone wheels because each little section has its own tab that lifts, so I'm never disturbing more than one section. And while I was skeptical about the rhinestone stick, with a little silicone piece at each end (large and small), it worked very well. Honestly, it was much better than the top coat method I had been using before this. Here was the end result of my watermelon nails! 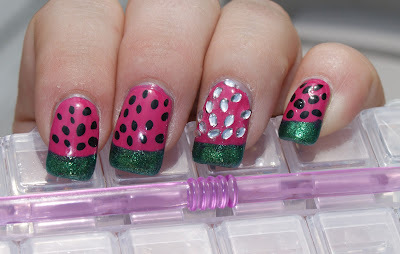 I used a glitter green foil (Zoya Ivanka) for the tips and a bright pink for the flesh of the fruit (Rimmel Posh Pink) and of course, the Stripe Rite paints for the seeds. On the ring finger, I thought it'd be cool to do an accent nail with the rhinestones instead because this shape looked JUST like seeds! Visit the It's So Easy website at www.itssoeasynails.com for more information on the variety of products and retailers near you. Be sure to also check out their Facebook, Instagram at @ItsSoEasyNails, Twitter, and Pinterest pages! Bingy watermelon! I love it! I love the rhinestones, very cool!